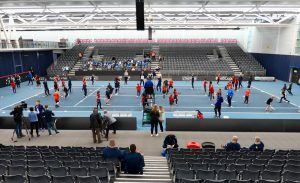 The Great Britain team and more than 100 local schoolchildren got to experience the newly-built Centre Court on Monday as a big week of international Fed Cup by BNP Paribas tennis got under way at the University of Bath Sports Training Village. 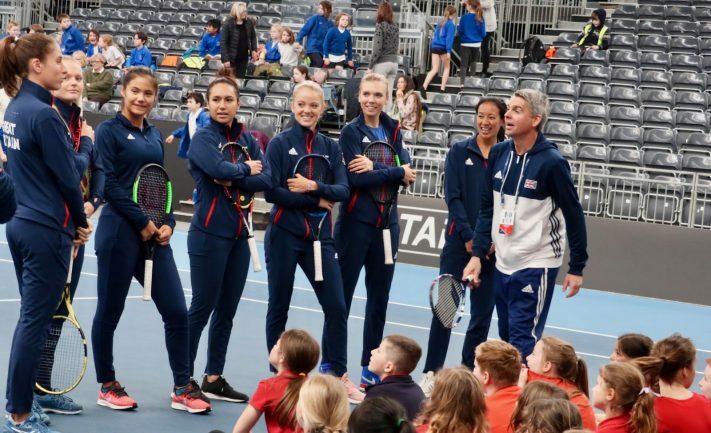 Johanna Konta, Heather Watson, Katie Boulter, Katie Swan, Harriet Dart and captain Anne Keothavong were joined in the 1,800-seater arena, which was constructed on the indoor courts over the weekend, by pupils from Batheaston Church of England Primary School and St Andrew’s Church of England Primary School for an exclusive Tennis For Kids session. The weekend’s wintry weather could not prevent the indoor courts at Team Bath Tennis – which are used by thousands of people of all ages and ability every year – being transformed ahead of this week’s Europe/Africa Zone Group I tie featuring eight nations. It is the first time since 1993 Great Britain has hosted the women’s team competition, dubbed the World Cup of Tennis, and British number one Konta cannot wait to play in front of the home fans at the University of Bath. “To be involved in a Fed Cup tie on home soil is an incredible privilege and I’m just excited to take part,” she said. “Home support is always important. We’ve always been fortunate on the road to have plenty of travelling fans but we’ve never experience being on home soil. It will be a new experience for the whole team and I’m sure we’ll make the most of it and enjoy it the best we can. One player who is no stranger to the courts is Bristol-based Swan, who used to do some of her training at Team Bath Tennis as a junior and won her first-ever junior tournament there. “It’s really great to be back in my home area and so exciting to be here, especially with all the memories I have of from when I came here when I first started playing tennis,” she said. “I played a lot of tournaments here when I was younger, from nine and under, and I managed to win a couple of them. I also used to come here a couple of times a week for training at one stage and I definitely have some happy memories from here. “The facilities are amazing. We’ve been training in the Team Bath Gym the last couple of days and you see all the other athletes from other sports. There’s a really good atmosphere here and it seems to be buzzing already. Great Britain are bidding to win promotion to the World Group II stages and have been drawn in Pool A along with Slovenia, Greece and Hungary, who they play in the afternoon sessions on Wednesday, Thursday and Friday respectively. Their goal is to top the group and face the winner of Pool B – featuring Croatia, Georgia, Serbia and Turkey – in the play-off decider on Saturday. There are two sessions per day, starting at 10am and 4.30pm, and two show courts, including a 300-seater Court 1. Nearly of all the sessions have sold out but there are a limited number of tickets available. Visit www.teambath.com/FedCup for further details and www.teambath.com/tennis to find out more about the all-encompassing tennis programme at the University of Bath.